It’s Drop In Time = $20.00 for 2 hours of learning and fun!! to help you with a few Christmas gifts. Although these classes are “drop in”, you can register right up until the day before the class date. You might be lucky and we have room, but if you don’t want to miss out on a particular class, please drop by to pay for the class in advance. so do check with us for those details. 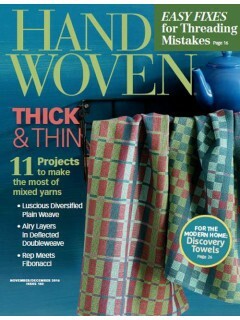 Mixed yarns highlight this issue of Handwoven, as weavers will read how to make the most of weaving thick and thin. Enjoy 10 projects with options for 4-shaft, 8-shaft, and rigid-heddle weavers. Whether it’s a deflected doubleweave scarf that separates into two layers at the ends, a rigid-heddle shawl that’s easy to weave and wonderful to wear, or one of the other must-weave projects, you will find plenty of reasons to cozy up with your loom! Deb Essen also shows you how to easily fix common threading mistakes. And in his column “Notes from the Fell,” Tom Knisely teaches you how to weave a beautiful baby blanket and gives an idea for a new family tradition. Spin Knit 2017 magazine NEW!! Spin & Knit features spinning and knitting projects for all skill levels, whether you just started or are more experienced. Explore your local fiber festival with our insider’s guide filled with tips such as wool show secrets, what not to miss, and how to shop like a pro. Learn about the animal fibers we love to spin from various sheep breeds to camelids to goats. We’re batty for batts—and we know you are too! Learn three ways to spin striped batts. Discover how to control color and texture and spin lofty, smooth, or wild yarn that make your knitting sing. New to spinning? Maggie Casey covers the basics with a step-by-step introduction to spinning. Anne Podlesak shares the inside scoop on how to get your special fleece processed at a mill. Already have a stash of handspun yarn? Leslie Ordal explains why not getting gauge is not a hindrance to knitting with your handspun. Get all this and more in Spin & Knit!